If you know someone who’s been playing D&D for a long time, you should ask them about the Elder Elemental Eye. While a lot of them might not know what you’re talking about, there are a few veterans out there who know well its portent of peril and terror. The Temple of Elemental Evil is the kind of module mentioned in the same reverential tones as Ravenloft and Planescape, and it’s among the most famous pre-made adventures in the history of tabletop RPGs. One of the most popular adventure modules released for Advanced Dungeons & Dragons, The Temple of Elemental Evil offered some of the earliest devotees to the world-famous tabletop RPG a taste of the forces of pure destruction that lurk in the Planes of Air, Earth, Fire and Water. The dungeons were treacherous—full of traps, cursed treasures and powerful opponents. Even the sleepy town of Hommlet hid a host of secret spies to undermine unwary adventurers. What gave the module its enduring appeal was that one could start a fresh batch of characters in the setting. In the course of their adventures, they would grow to become world-renowned heroes—assuming they survived, of course. It was the kind of module that defined the flavor and danger of D&D, while introducing players to the possibilities of subterfuge and intrigue that lay behind the Dungeon Master’s screen. While newer players may have heard whisperings of these adventures, witnessing the glassy-eyed remembrances of their forebears with curiosity and wonder, it’s been hard to track down the books to run it until just recently. There was a pretty good 3rd Edition module by Monte Cook called Return to The Temple of Elemental Evil, but it lacked the subtlety and atmosphere of its source material. Even the PC game The Temple of Elemental Evil attempted to bring that experience to a new audience, but the slightly buggy title never quite enjoyed the heights of popularity attained by the Baldur’s Gate, Neverwinter Nights and Icewind Dale series. In short, the forces of the Elder Elemental Eye have had their chance to dwell in the darkness, all but forgotten by the heroes of Dungeons & Dragons. Now, however, they plot to rise again in an all-new module for the newest edition of D&D—Princes of the Apocalypse. It makes sense that Fifth Edition, vaunted for its old-school systems and aesthetics, would be an occasion for Wizards of the Coast to revisit The Temple of Elemental Evil. From Page 1, it’s pretty clear that they and Sasquatch Game Studios invested an incredible amount of time and effort into making Princes of the Apocalypse an adventure rife with recognizable themes and familiar foes. The town of Red Larch has the same sleepy-town atmosphere as Hommlet did in years past, and the same broiling tension bubbles its way through the cracks. To a new player, the first few encounters of Princes of the Apocalypse make it immediately clear that something weird is going on. At first, it will take a great deal of deduction and perception to perceive the threads that tie each strange event to the next. However, as the players find more and more hints of the growing threat in the Sumber Hills, patterns begin to emerge, spelling out omens of doom. The traitors of Red Larch are ever keeping their knives sharp, and when the players start to learn too much, this sleepy town stirs from its slumber—awakening in violence and fear. 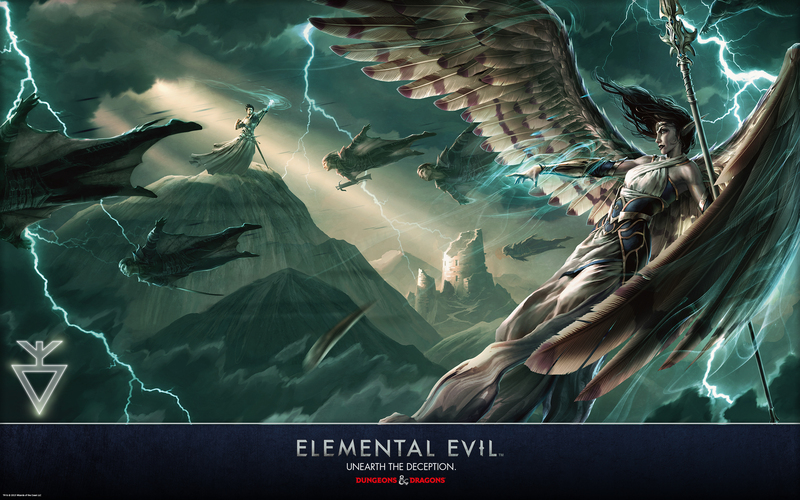 Veterans will see some similarities to The Temple of Elemental Evil in Princes of the Apocalypse, but thankfully, they’re mostly atmospheric and thematic in nature. The unassuming town that slowly buckles under the weight of its own corruption, the bizarre signs and practices of hidden cults, the intrigues that draw the party deeper and deeper into places thought long-abandoned—all are familiar, but the beauty is in how they have been twisted and changed to provide new avenues for exploration. See, that’s part of the beauty of Princes of the Apocalypse. It really does feed upon expectations, rather than leaning on them to justify its existence. As such, this is no mere cash-in, meant to capitalize on a familiar franchise. Rather, it’s a fully realized advancement from the classic adventure, one that inspires enterprising Dungeon Masters to plumb its depths for ideas and secrets of their own. To be completely fair, Princes of the Apocalypse is going to take a while to sink in. It’s a challenging module—not only for the players, but for the Dungeon Master as well. DMs need to keep track of subtle character motivations and take some serious notes in order to run this module well. As such, I would not recommend the main campaign to those just cutting their teeth on sitting behind the screen. That said, new DMs have plenty to learn from Princes of the Apocalypse. Chapter 6 contains tons of 1st- and 2nd-level encounters that not only provide some story hooks that can lead right into the main module, but can give a newer DM the chance to get comfortable running a more complex pre-made adventure. These are phenomenally crafted encounters that will spark the creativity of any DM looking to shake up the typical formula of encounter-building. In particular, many of them introduce in-encounter complications and monster motivations that are often overlooked by newer DMs. These are essential to creating engaging and memorable adventures for players, and getting some practice with it can really pay off. One of the best tools given to DMs in Princes of the Apocalypse might be the character hooks that are presented in the first chapter. These give your players a sense of purpose and belonging to the world, and can even work directly into their backgrounds, giving them a deep-seated motivation that drives them deeper into the plot. There’s even a faction guide for those lore-savvy players who want to bring their previous alliances into the game, allowing DMs to modify and adapt an existing party into the module practically seamlessly. Maps and illustrations flow throughout the pages, giving constant references to those who like to run things strictly by the book, while DMs who like the fast-and-loose approach can get some quick imagination fuel by flipping through the illustrations. There’s also a whole new arsenal of elemental threats in the back of the book for use in virtually any campaign. Be wary, though—some of the monsters in Princes of the Apocalypse test the very limits of their challenge ratings, and should be experimented with liberally before being transplanted into an encounter. That said, now that I’ve played around with a lot of these archetypes, I’ve found that many of the humanoid and elemental monsters fill in the challenge gaps left in their sections in the Monster Manual, making Princes of the Apocalypse an indispensable resource for creating my custom campaigns. That said, Wizards of the Coast made a really awesome Adventure Supplement to help DMs keep track of monster stat blocks and spells in one printable document. As a DM who absolutely has to have these stats on a separate sheet of paper (I’m a “Clipboard and Notebook Paper” kind of guy) it saves me a ton of time to have something I can just print out and make notes on as I go. It speeds up encounters and prevents me from tipping my hand to my players by asking for the Player’s Handbook to look up a particularly nasty spell. Now the only tip they’ll get is an outburst of maniacal laughter and the clatter of dice behind the screen. While adventure modules have historically been the province of DMs exclusively, one of the strongest aspects of Fifth Edition’s approach to the books has been their inclusion of strong, well-balanced character options. Using Princes of the Apocalypse, players can assume the role of one of the Genasi, a humanoid race of elemental descent. This race option gives players a particularly resilient character with strange and interesting abilities that factor well into virtually any campaign. It’s clear that these were playtested extensively, and they make for some pretty cool characters, so the addition is welcome. In addition, a whole suite of new spells has been added in Princes of the Apocalypse. Instead of feeling gimmicky, these actually have some serious utility, and many of the cantrips feel like they would have fit right into the Player’s Handbook. It’s encouraging to see that Wizards of the Coast seek to expand player options whenever possible, and giving this little extra bit to the player makes it that much easier to justify picking up an adventure module like this. However, lest one think Wizards of the Coast are holding these features hostage and forcing players to buy accessory books to get this little infusion of goodies, they offer all of this stuff and more in their Elemental Evil Player’s Companion, which is a totally free PDF available on Wizards’ own website. Now that is something to get excited about. If you’re the kind of legacy player who wants to build an epic-level character from the ground up, you really can’t do much better than Princes of the Apocalypse, which can take a character all the way from Level 1 to Level 15. For those who have never reached Level 15, that’s a ton of ground to cover. Very few adventure modules can sustain such a huge variance in difficulty. Meeting well-scaled challenges with strong storyline continuity can be really cool, especially when there’s a whole host of fun stuff to do for a party that wants to push on even further and experience D&D all the way to Level 20. Princes of the Apocalypse offers an adventure that will take even the most experienced adventurers months to complete. It’s a powerful guide full of unique encounters, brilliant locations and tons of great ideas for Dungeon Masters new and old. The dungeons are solidly built and lend themselves well to unique approaches, and the central villains have strong personalities and back stories that allow for both deep roleplaying and fierce combat. It’s so cool to see how much development went into Princes of the Apocalypse, and its non-linear nature makes it so that no two parties will experience it in the same way. Princes of the Apocalypse is also extremely exportable, with suggestions in the back that illustrate how the different factions and locations can be represented in the Dark Sun campaign setting, Eberron, or even its original home in Greyhawk. This is the kind of information that often gets overlooked in the rush to get adventure modules out the door, but even having a couple of pages of examples makes it possible for me to work these details into my own adventure, letting my players cross paths with it and follow the threads if they’re interested. Best of all, it has the same incredible attention to art and other visuals that gave the core rulebooks their beautiful charm. Pages upon pages practically overflow with scenes of battle, repose and discovery, and there’s even a section in the back with additional concept art that didn’t find its place in the rest of the book. As mentioned above, Princes of the Apocalypse is as much a challenge for the players as it is for the DM. The tradeoff of having an awesome, non-linear adventure is that running them takes a lot of prep work. However, this is the kind of test that I feel more DMs need to experience, acting as a kind of purgatory that forces you to bring your A-game to the table every time. If you run Princes of the Apocalypse well, your players are going to be telling stories about it for the rest of your natural lifetime. In short, Dungeons & Dragons Fifth Edition only grows stronger with the inclusion of Princes of the Apocalypse. Its old-school aesthetics and new-school accessibility make for an engrossing campaign that can quite literally run off the edges of the map. 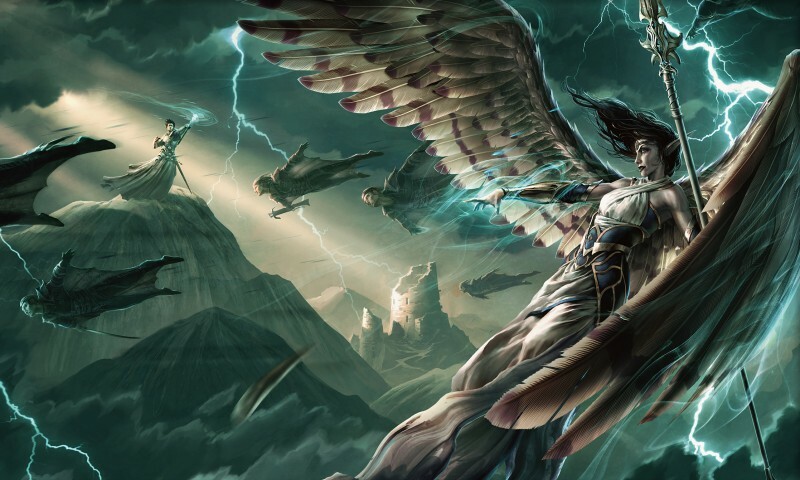 If you’re looking for a quest that will bring your players toe-to-toe with everything from secret cults to extraplanar entities of destruction, all while offering a rich world and exciting story, it’s time to call your play group and pick up Princes of the Apocalypse. You’ll need the time to prepare. Just don’t wait too long. The Elder Elemental Eye is open once more, and the cults of Elemental Evil are gathering strength. Can you prevent the coming apocalypse? Keep an eye out for Out of the Abyss, the upcoming adventure module for Dungeons & Dragons, which is slated for release on Sept. 15. It’s planned to feature an extensive adventure set in the deepest reaches of the Underdark and the demonic whorl of the Abyss.